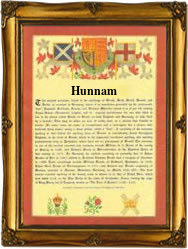 Recorded in several spellings including Hanham, Hannam, Hunnam and Hannum, and sometimes confused with the Irish Hannan and Hannon, although they are not in anyway conected, this is an English locational surname. It originates from the village of Hanham, in the county of Gloucestershire. This village in the spelling of Hanun, is first recorded in the famous Domesday Book of 1086, and later in the Pipe Rolls of the county in 1153 as Hanum. The name translates as 'The stone house' from the Olde English pre 7th century word 'han' meaning stone, and the later Anglo-Saxon 'ham', a homestead or house. As few houses before Norman times were constructed of stone, 'Hanun' no doubt represented quite a feature in the local countryside. Locational surnames are generally 'from' names. That is to say that usually they were given to people after they left their original homes, and moved permanently elsewhere. It was, and to some extent it still remains, that one of the easiest ways of identifying a stranger was to call him or sometimes her, bu the name of the place from whence they came. Spelling being at best erratic and local dialects very thick, lead to the development of 'sounds like' spellings. In this case early exanmples of the surname recordings include: Thomas de Hanum of Somerset in the Hundred Rolls of 1273, and later John Hannam of Dorset, who is recorded in the register of students of Oxford University in 1577.